LASIK involves putting the PRK treatment not on the surface of the cornea, but under a protective corneal flap. A very thin (about 0.16 mm) and precise flap is raised by a special instrument known as microkeratome. The result is a corneal flap attached at one edge, the hinge. The surgeon folds the flap to expose the inner stromal layer of the cornea. The excimer laser treatment is applied on this stromal bed to remodel it. After this the flap is repositioned to its original position and it does not require any suture. Since the corneal epithelium has only been minimally disturbed, there is only mild discomfort after the procedure. 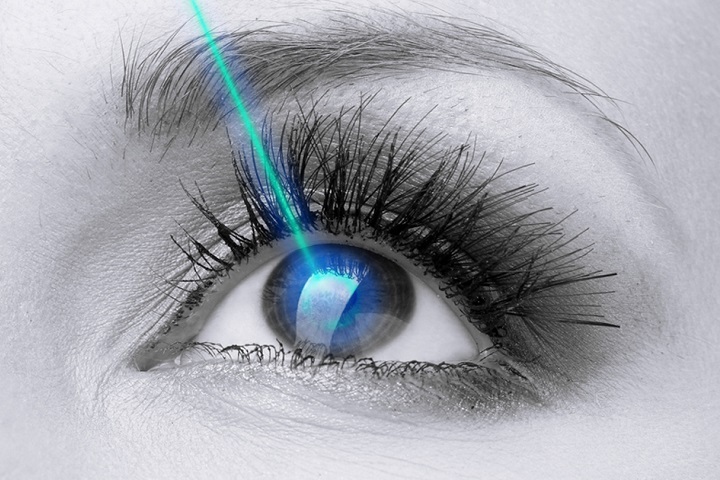 Laser Assisted Stromal In-situ Keratomileusis [LASIK] is a method of re-shaping the external surface of the eye [the cornea] to correct low, moderate and high degrees of nearsightedness, astigmatism and far-sightedness. During the treatment, an instrument called the microkeratome creates a corneal flap to make it a painless procedure. What are the complications of LASIK? LASIK is a very safe procedure with a majority of patients achieving very good results. However, since it is a surgical procedure, it does carry some chances of complications as well, which would be discussed with you before the surgery. The overall rate of significant complications in LASIK is only of the order of 1-2%. This is a special form of LASIK in which the treatment parameters are customized for the particular patient, based not only on the refractive error, but also on the corneal map of the eye and other findings detected by special tests. This procedure tries to correct aberrations, maintains normal shape of the cornea and gives better night vision. Lasik is a procedure to correct nearsightedness farsightedness and astigmatism. It utilizes the microkeratome to create a corneal "flap" of about one-third of the total corneal thickness. The excimer laser is then used to reshape the exposed middle layer of the cornea. The flap is finally put back to assume a new shape created by the excimer laser. In Blade free LASIK surgery, a laser called IntraLase is used to create the flap. The IntraLase is a blade free LASIK surgery system that creates the corneal flap by forming a layer of bubbles beneath the outer layer of the cornea with the use of rapid pulses of light. Blade free is 100% safe. Blade free LASIK definitely is safer for patients with thinner corneas who may not have been ideal candidates for LASIK with Blade. Indraprasth eye tech F-19,First Floor,Above Corporation Bank,Ashirwad Complex,Sector 53,Noida-201301.